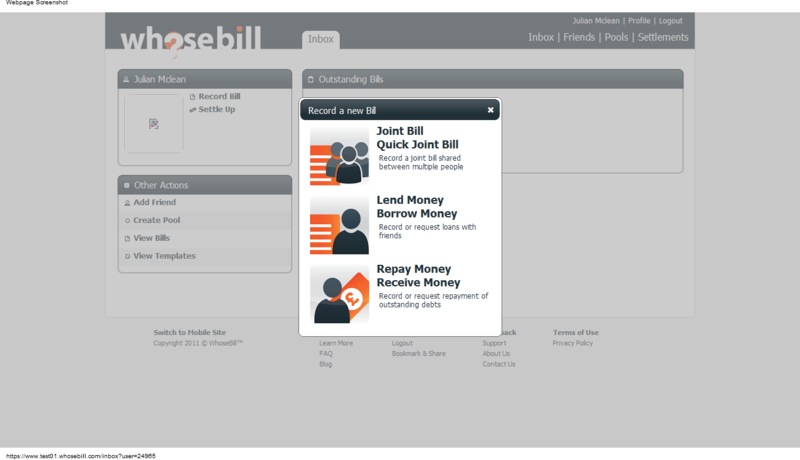 We've added some new features to WhoseBill this week based on recent user feedback - we hope you find them useful! WhoseBill now supports a much wider range of currencies, including Indian Rupees and several others. You can choose your preferred currency when signing, or adjust it at any time from your profile. Whilst your there, don't forget to set your country and timezone, which will help WhoseBill work out when it is best to send you reminders and make sure the date sand times are right for your region. Remember, WhoseBill takes care of conversion automatically to offset bills and payments in any currency, so all you have to worry about is telling us how much you spent and what the coins looked like! If you've already been using WhoseBill with a different currency, because yours wasn't previously supported, you may want to go back and update the currency for any bills you've already created. Remember that you will need to change all bills, otherwise WhoseBill will offset them using the latest exchange rates. Another option is to settle up first, and then start entering bills in your native currency. We've introduced a new feature for entering simple bills quickly using just text, as you might do using Quick Add on Google Calendar or RememberTheMilk. 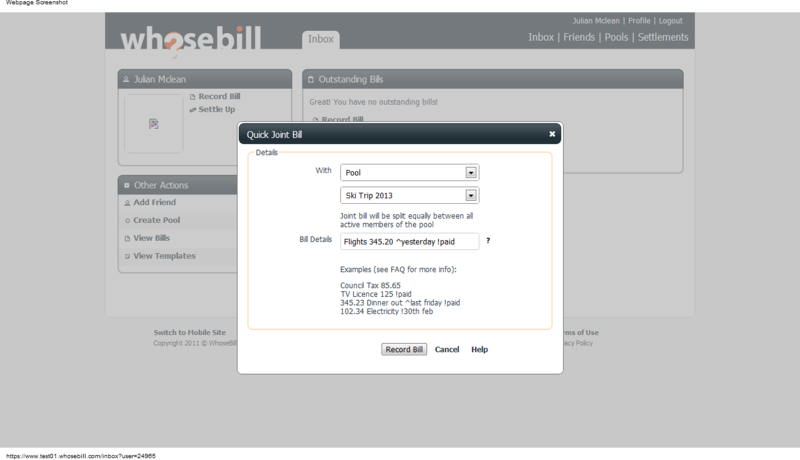 When you click to add a new bill, you'll see a new option for Quick Joint Bill. 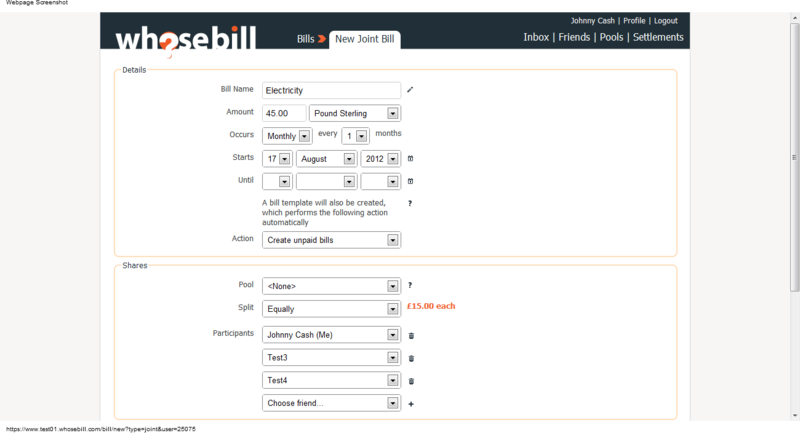 This lets you enter equally split joint bills for one of your pools or friends by simply entering the title and amount in one box. You can also specify the date and whether or not the bill is paid by using the simple syntax. On your pool and friend screens it's even easier - just enter the name and amount in the new Quick Add box on the left an the bill will be automatically split with that pool or friend. In the future we plan to extend the quick add syntax and also allow adding of bills from other channels such as SMS and email. 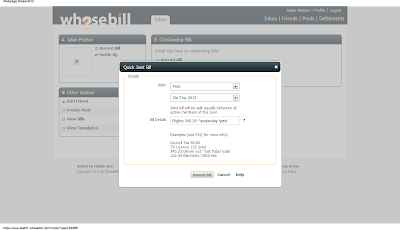 WhoseBill can now remind you when bills are due and have outstanding amounts to pay. This really helps keep on top of the finances and makes sure that you don't get charged for late payments. To use Bill Reminders, just set a due date on any unpaid or partially paid bill, and WhoseBill will email the involved people when the date is reached if the bill is not paid. If you would rather not receive the reminders, there are options in your profile to enable/disable them. 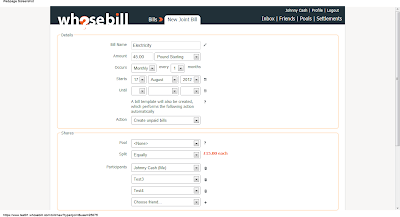 Last, but by no means least, we've added a whole new feature to make managing recurring bills much easier. This was a much requested feature from users moving from other systems, and we hope that this will make life easier, especially for house shares. Recurring bills are managed via Bill Templates in WhoseBill. These let you prepare the outline of a bill in advance and then either recur on a regular interval, or just wait for you to create bills from it ad-hoc. Bill Templates give you the option to either simply remind you that a recurring is due and you should create it, or can do some of the work for you and automatically create an unpaid bill every week, month, etc ready for someone to pay. And don't worry, WhoseBill will always inform the relevant people by email of any bills created automatically, and let you approve/contest as normal. To use Bill Templates, you have a couple of options. Firstly, when entering a new bill, you now have the option to choose when the bill occurs, either one time only, weekly or month. Choosing one of the latter options will give you some more choices on exactly how often to recur, how long to recur for, and the action to take. You can also see all of your Bill Templates in one place by going to your Templates page from your inbox. From here you can create, modify and delete any bill templates or recurring bills you have setup. You can also follow links from any individual bills that were created from a template. We'll be working on more improvements over the coming weeks and months - keep those suggestions coming so we know what is most important!